I have been looking for an excuse to make homemade Chicken Tortilla Soup for a long time. 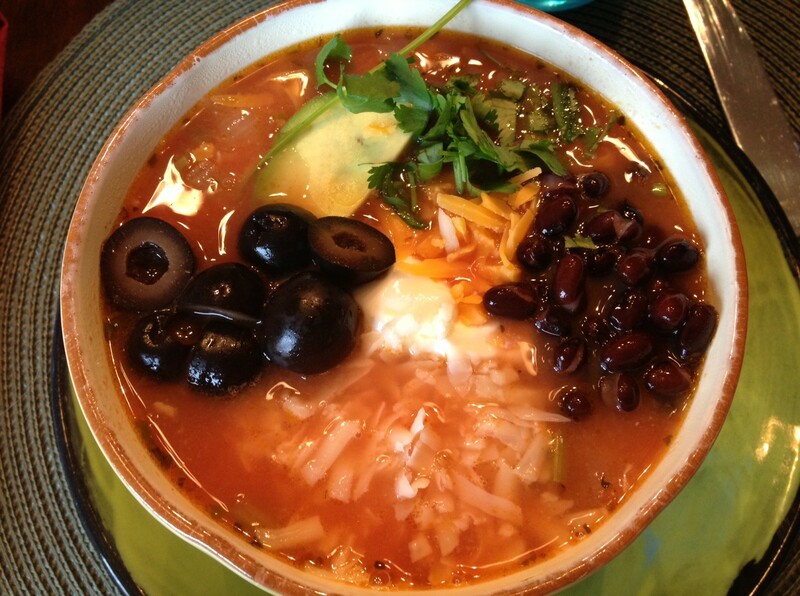 It’s one of those soups that you can eat on just about any occasion, it was perfect on a sunny spring day with some homemade margaritas and guacamole. The best part is it is also super easy! I cannot wait to make this a staple around my house. My aunt advised to use the chicken with skin on and bone in since it has more flavor, it was a little more effort but worth it! Adding black beans and olives is totally optional here, but 100% necessary for me in just about every mexican dish. 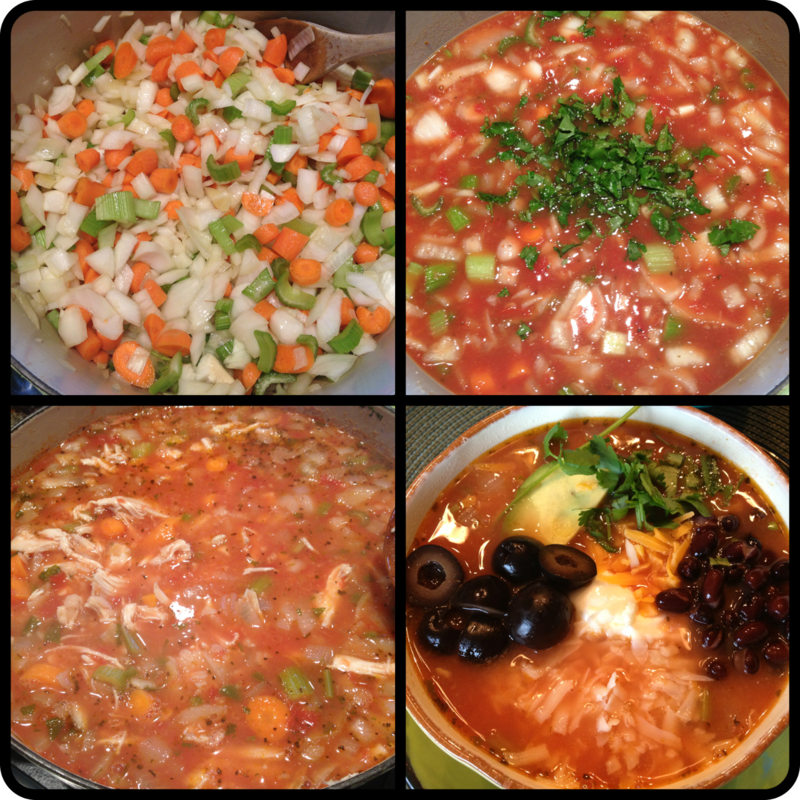 One of the most fun parts of Chicken Tortilla Soup is all of the add-ins you use to make it your way! 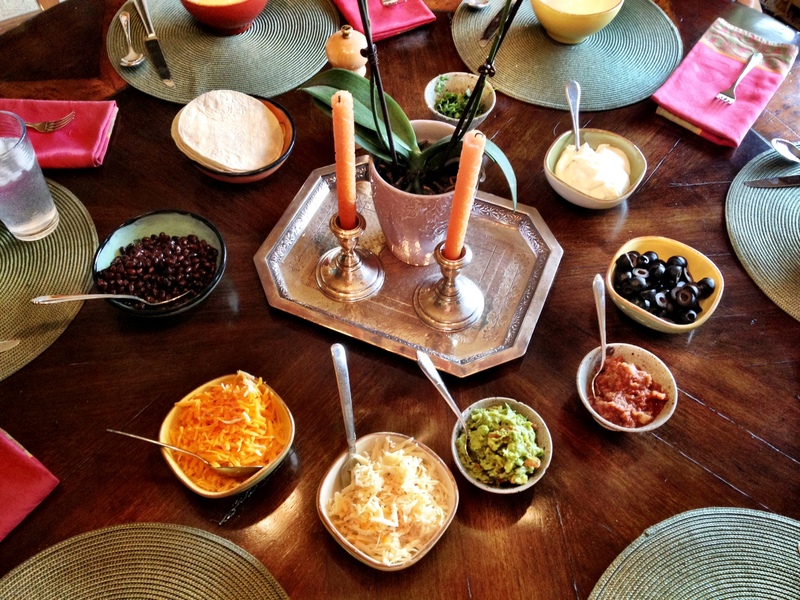 We had tortilla, chips, sour cream, cheese, avocado, black beans, salsa, and black olives on the table for people to choose from. I also didn’t know Ina Garten had an aversion to cilantro, it is so sad when I find out people despise the herb, but I know it’s typically a weird genetic thing. The process – cook veggies first, add broth and tomato puree, chicken goes in last and you’re done! we served 6, but there were still LOTS of leftovers! Meanwhile, heat 3 tablespoons of olive oil in a large pot or Dutch oven. Add the onions, celery, and carrots and cook over medium-low heat for 10 minutes, or until the onions start to brown. Add the garlic and cook for 30 seconds. Add the chicken stock, tomatoes with their puree, jalapenos, cumin, coriander, 1 tablespoon salt (depending on the saltiness of the chicken stock), 1 teaspoon pepper, and the cilantro, if using. Cut the tortillas in 1/2, then cut them crosswise into 1/2-inch strips and add to the soup. Bring the soup to a boil, then lower the heat and simmer for 25 minutes. Add the shredded chicken and black beans (if using) and season to taste. Serve the soup hot topped with sliced avocado, a dollop of sour cream, grated Cheddar or Pepper Jack cheese, and broken tortilla chips. You set such a nice table, and the soup looks yummy! can’t wait to make it. It was super yummy again today. I had it for lunch. Thank you again Lauren, you’re a super champ!